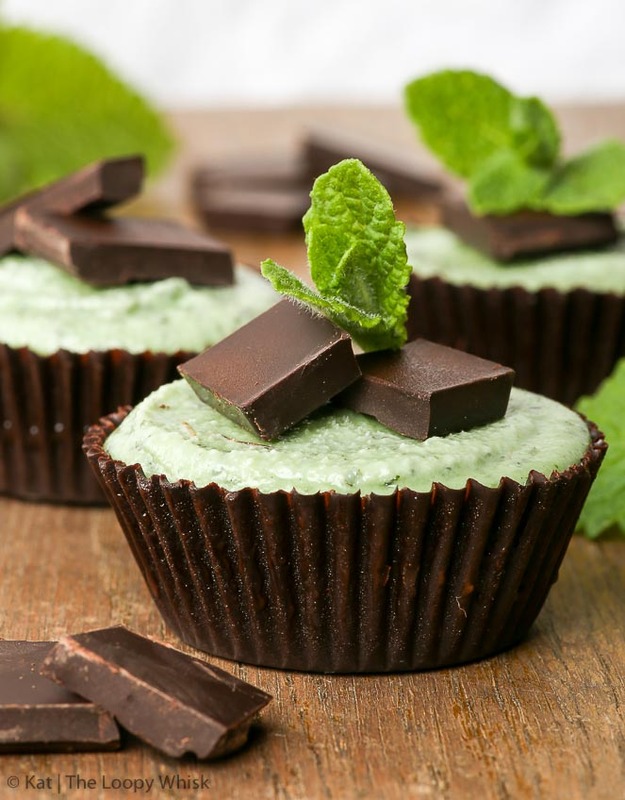 These chocolate & mint raw vegan cheesecake bites will blow you away with the perfectly paired flavours of dark chocolate and mint. 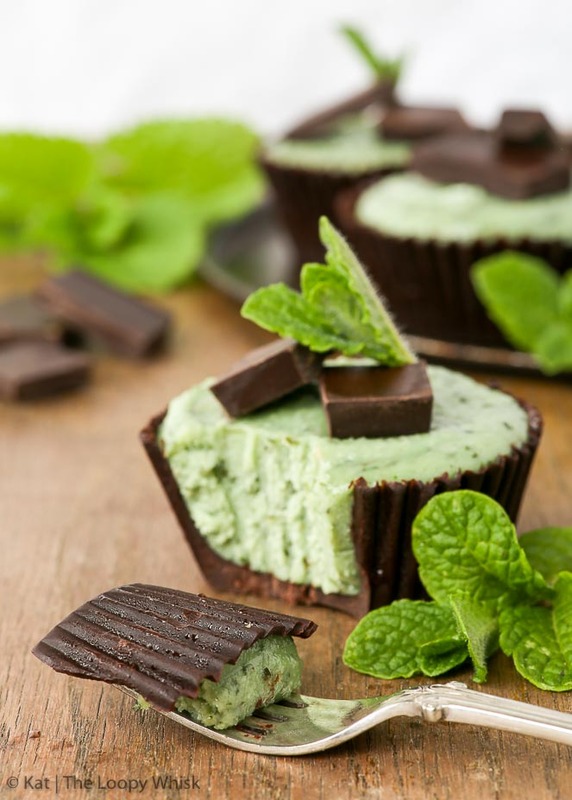 The raw chocolate cups have just enough bite to them and melt the moment they hit your tongue, while the mint filling is incredibly creamy and decadent. Super easy to make, these vegan cheesecake bites are gluten, dairy, egg, soy and refined sugar free. There seem to be many misconceptions about raw (vegan) desserts. 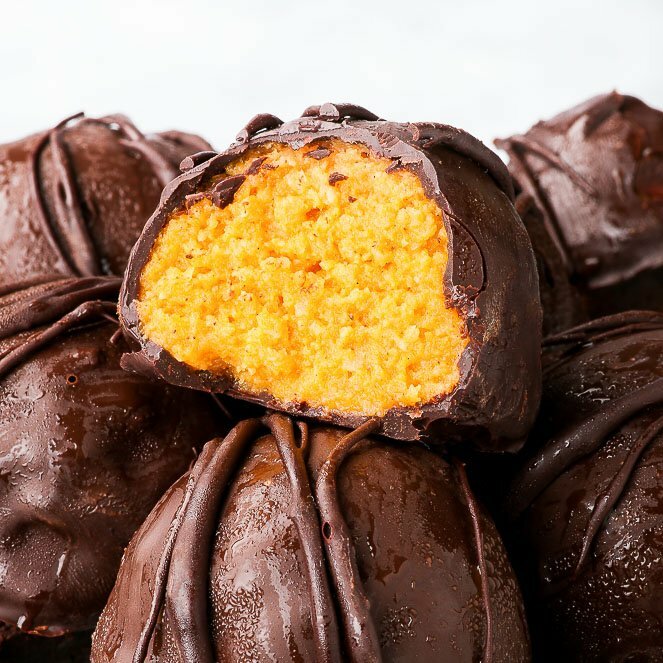 They are often regarded as poor substitutes for “normal” desserts (that is, those that contain flour, eggs, sugar and butter, and are usually baked), as if their taste and appearance can’t match up to a certain idea of what a dessert should be. But here’s the thing: raw desserts are absolutely marvellous – they open up a whole new world of exciting flavours and textures. You might scoff at this point, thinking to yourself: “Puh-lease: vegan cheesecake? As if!” And yes, a vegan cheesecake can never compare to the usual cream cheese-containing cheesecake. However… that’s like saying an apple can’t compare to a pear. Duh. They’re different. But (and it’s an important but) it doesn’t mean that the vegan cheesecake isn’t just as mouth-wateringly delicious as the dairy-containing version. And yes, some may take offence at calling the vegan dessert a cheesecake if it doesn’t contain (cream) cheese. But again, semantics. It’s super duper delicious and that’s really the only thing that should and does matter. Regardless of what you want to call them, these chocolate & mint raw vegan cheesecake bites are a revelation. They have everything going for them. Taste. Texture. Appearance. It’s all there. The chocolate cups have a satisfying snap to them and they melt the moment they hit your tongue. The “cheesecake” filling is actually made from blended cashew nuts, coconut oil, maple syrup and a whole lot of fresh mint. A sprinkling of wheatgrass powder and spirulina if you want a deeper minty green colour, plus the added healthy stuff means you could (potentially) get away with eating these lovelies for… breakfast? Hey, why not – start the day on a high! 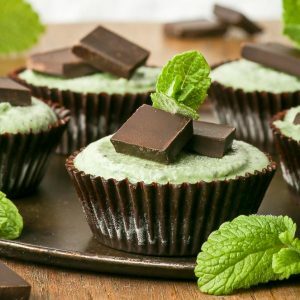 This incredibly creamy mint filling pairs wonderfully with the chocolate – after all, there are few flavour combos as amazing as chocolate and mint. 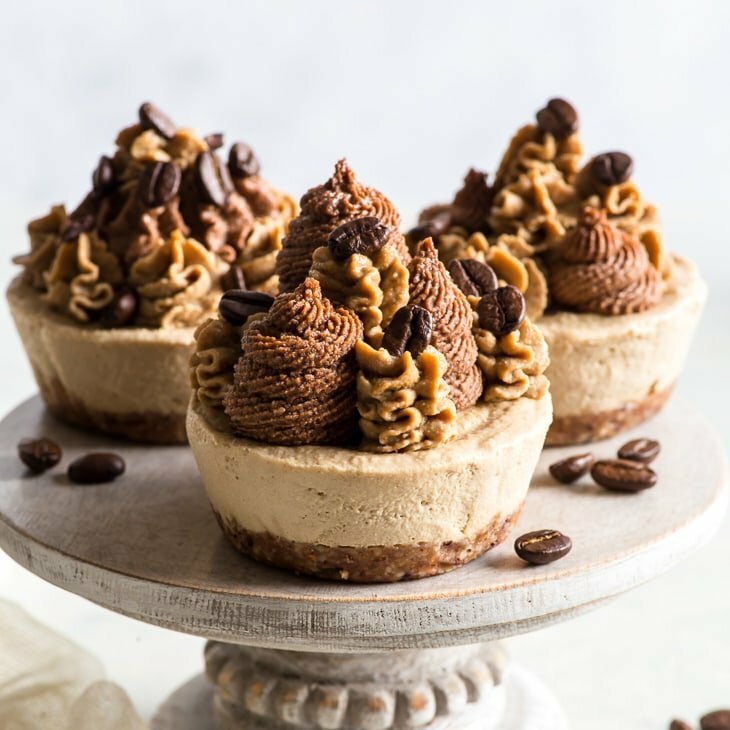 In addition, these vegan cheesecake bites are surprisingly easy to make, plus they are gluten, dairy, egg, soy and refined sugar free, as well as vegan and paleo. Whatever your dietary preferences, I guarantee that you’ll absolutely love them. But above all, they are fun, delicious and exciting to make. 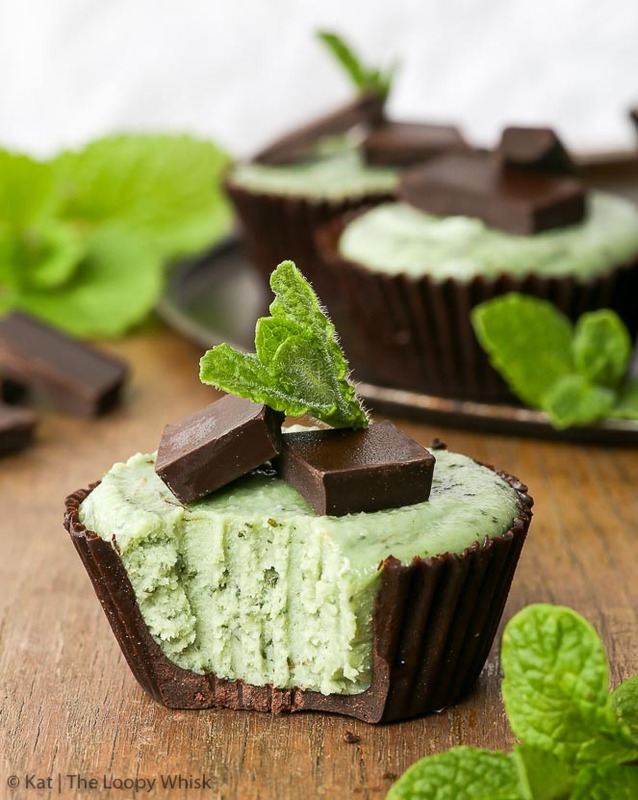 Trust me, once you’ve tasted these chocolate & mint raw vegan cheesecake bites, you’ll want to make them again and again. Whether or not they should be called “cheesecakes”… that’ll be the about last thing on your mind. When sufficiently coated, turn the cupcake case on its head above the bowl and let the excess chocolate drip into the bowl. After all cupcake cases are coated, place them onto a tray and freeze for at least 1/2 hour. 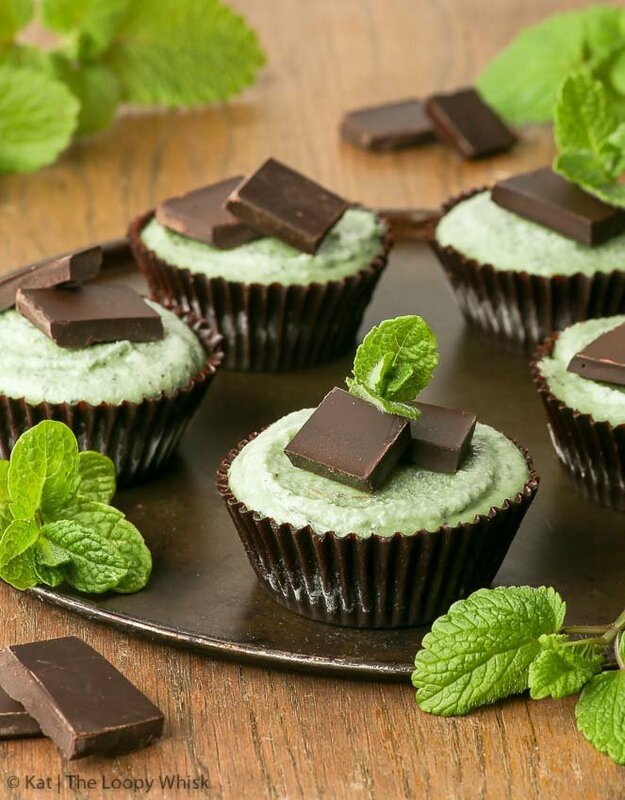 Combine all mint "cheesecake" filling ingredients in a blender and blend until smooth. Freeze the vegan cheesecake bites for at least 1/2 hour. Carefully remove the cupcake cases. I've found it easiest to first tear away the sides and then remove the cupcake case bottom at the end. Freeze again. 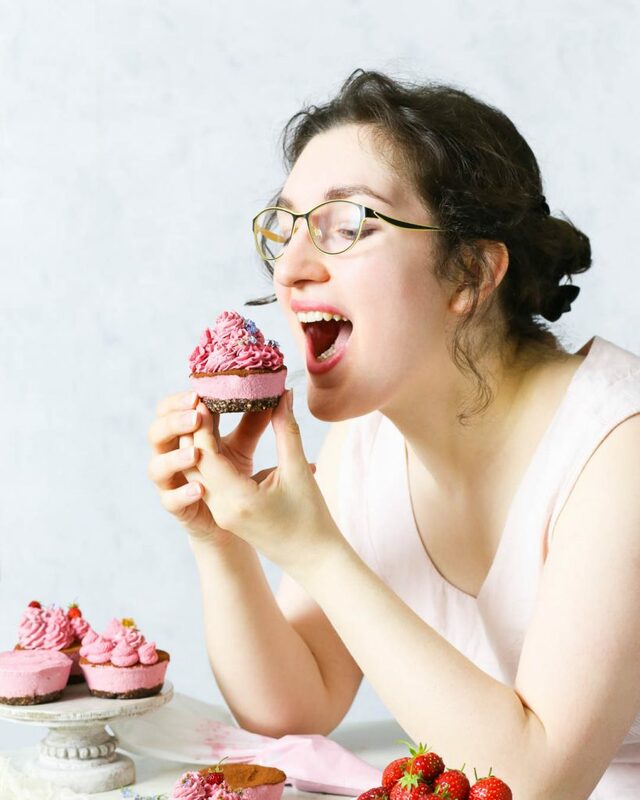 Take the vegan cheesecake bites out of the freezer for at least 10 to 15 minutes before serving. Enjoy drizzled with more chocolate, with whipped coconut cream, or as they are. Note 1: It's entirely up to you what type of mint (or which combination) you choose. Moroccan mint, peppermint and lemon balm work well. 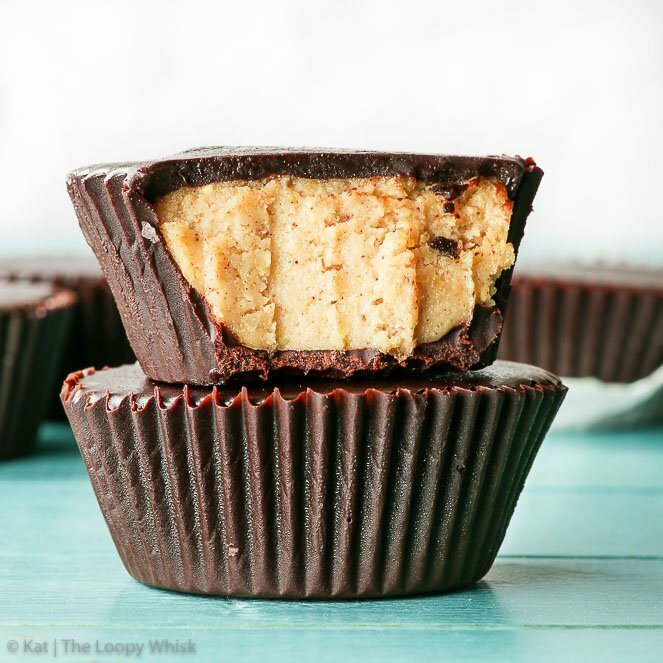 Looking for more raw vegan deliciousness? I’ve got you covered! I love mint and chocolate. These are stunning! Thank you, Melanie – glad you like them! You’re very welcome, Amanda! I haven’t tried these with chocolate mint, but it should be absolutely divine 🙂 Do let me know how they turn out! 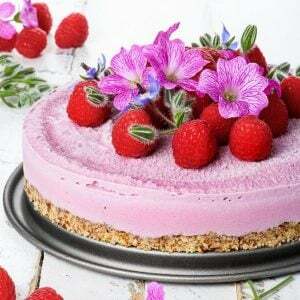 I have been looking for a vegan cheesecake recipe for along time now. These looks perfect and so beautiful. Thanks for sharing this wonderful recipe. I cannot wait to try it. What could I use besides cashews? You definitely want something that won’t overpower the mint and gives the creamy texture… You could go with almonds (blanched/without their skins), or maybe macadamia nuts. (Both soaked in water until softened.) It really depends on which of these you prefer! 🙂 Hope they turn out well! are pretty terrific! Just don’t use too much avocado!! I’m at my wits end. The chocolate mix has separated and won’t go smooth and runny. IT had no water in it. Help!!!!! Hi Joy! So sorry to hear you’re having troubles 🙁 I have to say, I’ve made this recipe about a bazillion times, and the only time the mixture has separated is when there was a bit of water in there. Make sure there’s no water on the mixing utensils and the bowl as well! Other than that… what sweetener are you using? Does the coconut oil have some water in it? I’ve made these with both maple syrup and honey, and it should work fine with both… Perhaps try a different sweetener? Hi, I’m interested in making these this weekend. I would like to know the purpose of the wheat grass and spirulina. Is it to make it bright green? I have matcha in my cupboard so it would do the trick also. Please let me know if you have ever tried matcha and if it would work. Thanks. 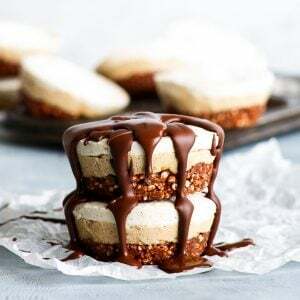 I am making this now and the chocolate base is a disaster. I followed the recipe to a “tee” and the consistency is much thicker than melted chocolate. It does not swirl at all. I then decided to pop the mixture in the microwave to heat it up to see if that would work and it became even thicker and not usable at all. It is more like dough now. I am hoping this is not a waste of expensive ingredients. I am also using pure ingredients, high quality for everything. No water is on any utinsils and I used a spatula to level and scrape out all the measurements. I found that if you have too much cocoa it goes too thick. Different cocoa reacts different too so maybe use less or try a different brand. What do you mean by cupcake cases? Is this just a regular cupcake tin? Or is it cupcake paper wrappers? That’s what i was imagining, but i wanted to be 100% sure. Thank you so much for the reply! Can’t wait to make these, and see how they taste!! Can they stay in room temperature for some hours ? Or do they get sticky ? Hi Jeny! After you prepare the chocolate mixture (from the coconut oil, salt, maple syrup and cocoa powder), you need to let it cool down until warm. Then you spoon a bit of the mixture into a cupcake liner and swirl it around so that it covers the inside of the liner. You will need to swirl it a couple of times so that the chocolate really covers the walls of the liner. After that, you turn the liner on its head so that the excess chocolate drips away.Then you freeze the coated cupcake liners for at least 1/2 hour so that the chocolate sets. If the chocolate shell is too thin, coat with more chocolate again (repeating the swirl + remove excess + freeze process again). These look so delicious. Just wondering are you using cacao powder? or cocoa? 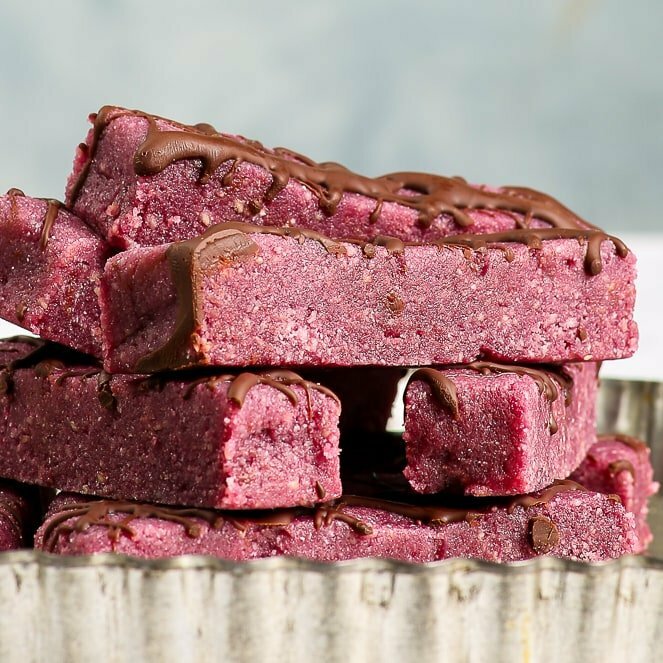 These are honestly the greatest paleo desserts I have ever made! I haven’t made them since last summer so I can’t wait to get back to them! I usually use mini muffin cases so they’re bite size and they have always turned out great! Thank you so much for making this recipe and sharing it! Hey, these look really good, but I’m allergic to tree nuts. Is there anything I can use besides cashews? 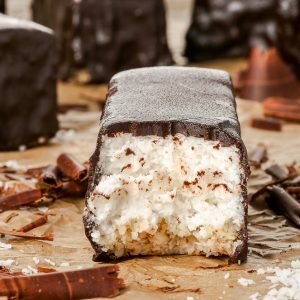 I suppose you could try sunflower seeds, but those will give a very different consistency and taste… alternatively, you could make a coconut cream filling to go into the chocolate cups.